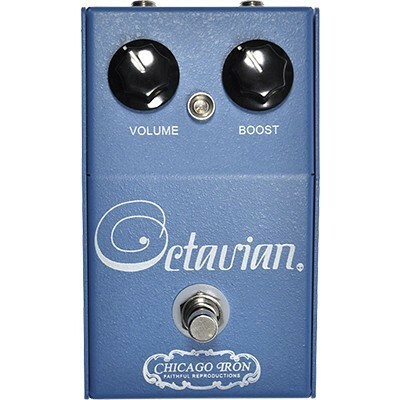 The Chicago Iron Octavian Octave. The same great circuit as the Tycobrahe SE, but has an indicator LED mod requested by players and less expensive knobs and art. The pedal is true bypass and has 9v jack. As you may already know, the Tycobrahe® Octavia was built like the fuzz faces. The Octavia uses the usual transistor based gain circuit like most vintage fuzz pedals, with the addition of transformer coupling. They didn't spend a lot of time "matching" components in the circuit back then. There were good ones and not so good ones allowing players the fun of searching through boxes of pedals at stores to find one they liked - like the legend of Jimi Hendrix says he did with his Arbitor Fuzz Face pedals. Most builders now know the importance of meeting certain parameters for the transistors that are combined in a fuzz circuit. We searched the country and all our player and tech friends searched their effect arsenals for the best sounding Tycobrahe® Octavia pedals. We wanted to build a truly faithful copy, and knew the Octavia pedals used by SRV and other artist were painstakingly hand selected. We knew we had to have a good sampling of the old pedals to find the best sounding circuit we could to use as a reference point. We settled on seven of them. That alone was no small feat. They all did the job but some were warmer, tracked better, bloomed harmonics more evenly and were more touch sensitive than others. After we selected the best one we dated it. It was from 1974. It was like a fuzz on the first 6 frets and as we headed up the neck it produced wonderful ring modulator tones with a hint of octave all around the middle neck positions. When we rolled the tone off the neck pickup and played above the 12th fret...it produced the trademark Jimi octave tone. The kind of tone that gives you goose-bumps. This pedal was really fun to play. Then I had the task of measuring each of the components and matching them. I matched them to the same specs as the original 1974 "good one". I built a formidable clone of the board and populated it with the hand matched components. It tested out to rival the '74 in every way and all of the players A/B'd them with great results. Same fuzz, ring-mod and octave! Now I can put 5 Chicago Iron Octavian™ pedals in the signal chain together and they all play and sound the same. Even the knob positions are true to each other from one to the next. Goose-bumps. Jimi's trademark "ghost note" octave. SRV's Voodoo Chile. It is as close to a hand selected and coveted original as you can get for about $700 less. Yes they are true bypass also. Includes 9 volt jack.